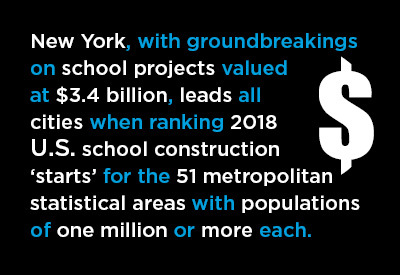 Leading all cities was the Big Apple, New York, with groundbreakings on school projects valued at $3.4 billion. In second place, not far behind, was Dallas-Ft. Worth, at $3.1 billion. The Dallas portion of the $3.1 billion was two-thirds (67%) and the Fort Worth portion, one-third (33%). There was another twin city result that was noteworthy. In San Francisco-Oakland (8th spot), the former’s piece of the pie was only 37% while the latter’s slice was a more taste-satisfying 63%. Among the 25 MSAs in Table 1, significantly large year-over-year percentage change gains were recorded by: Portland, +202%; Sacramento, +193%; Las Vegas, +129%; Providence, +80%; San Diego, +67%; Cleveland, +59%; and Raleigh, +54%. While they wouldn’t have made it into the Top 25 cities in Table 1, several smaller centers with populations of less than 1 million each also managed high levels of educational facility starts in 2018: Madison, Wisconsin, $476 million; New Haven, Connecticut, $464 million; and El Paso, Texas, $407 million. For the entire U.S., ‘junior and senior high school’ starts accounted for the biggest portion of the total dollar volume of educational facility starts in 2018, at 43%. The shares taken by ‘preschool and elementary schools’ and ‘colleges and universities’ were almost the same, 28% and 27% respectively. ‘Special and vocational schools’ were only a small part of the mix, 2%. With respect to dollar volumes in 2018 versus 2017, and across the whole nation, ‘junior and senior high school’ starts were +14.1%; ‘preschool and elementary’ school starts, +1.8%; ‘special and vocational school’ starts, -1.8%; and ‘college and university’ starts, -15.5%. *There are 51 metropolitan statistical areas (MSAs) in the U.S. with populations exceeding 1 million.